What Is the Difference Between Freshwater & Marine Life? Freshwater and marine (or saltwater) life survive in different environments. The fish are unable to survive in each other’s environment because of the difference in physiology. If you want to keep a tank with freshwater or marine fish as a hobby, it’s vital to understand the differences so your fish will flourish. The main difference between freshwater and marine life is the habitat they come from in the wild. Freshwater fish live in streams, rivers and lakes that have salinity of less than 0.05 percent. Depending on the species, fish can survive in temperatures ranging from 5 and 24 degrees Celsius. They can adapt to a change in habitat, like the rise and fall in water levels, temperature and oxygenation levels. Marine life refers to fish living in oceans and seas. These are also known as saltwater fish because they can only stay alive in waters with high salinity levels. A marine animal's habitats include coral reef and seagrass bed. The physiology of fish determines which habitat they live in. The way their organs work means frreshwater fish retain more salt in their bodies than in the water they live in. This is why they can survive in waters with less than 0.05 percent salinity. 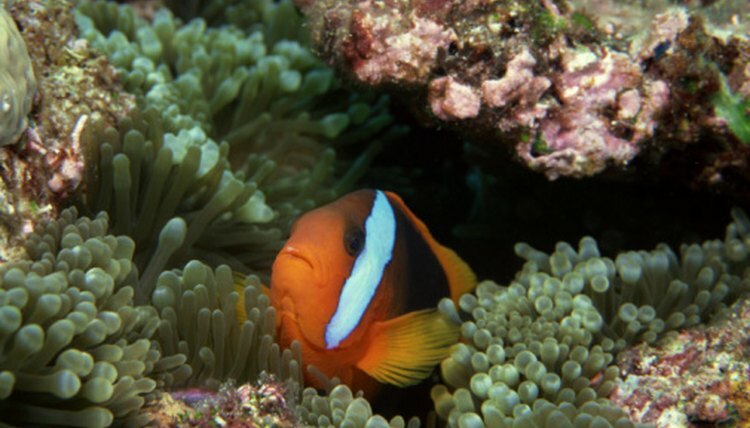 Saltwater fish lose water to their surroundings through the process of osmosis. They need to drink lots of salty water to maintain a healthy body, which is why they live in oceans and seas. There are different varieties of freshwater and marine species. Freshwater fish can be cold water or tropical varieties. Cold water species include pike, trout, shiner and goldfish. Examples of tropical freshwater species are pacu, golden barb, red-tailed red eye puffer, catfish, guppy and angelfish. Marine fish are all cold-water fish. These include seahorses, eels, jellyfish, clown fish, sharks, common dolphin and tuna. If you want to keep either freshwater or marine life you should be at certain levels of fish-keeping experience. Freshwater fish are easier to keep alive in an aquarium because they can adapt to changes in the water environment. Marine life is sensitive and can only stay alive if there’s a certain level of salt in the water. These types of fish need someone who can monitor the salt water levels and create the right habitat for them to thrive in. Scientific American: Why Do Some Fish Normally Live in Freshwater and Others in Saltwater? How Can Some Fish Adapt to Both?